Enzo Ferrari died 30 years ago today, and the Maranello-based company took advantage of the occasion to dedicate a few affectionate words to its founder. Enzo Ferrari was an unparalleled example of a practical dreamer, a man who created a company from scratch that has become renowned worldwide for its sporting results and its market excellence. "If you can imagine it, you can do it", was one of his favourite mottos. And there is no doubt that Ferrari had an extraordinary ability to make real the ideas that his curious mind focused on in a life that was very intense but also marked by habits and a series of routines that rarely saw him leave Modena and Maranello. 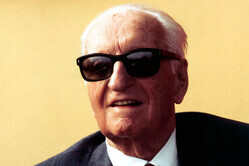 Enzo Ferrari never took a holiday. Sometimes when he let himself have a half-day in Viserba, on the Adriatic Sea, he popped into the company on his way home, to write down any ideas he may have had, and to check that everything was going well. It was almost as if he needed to give the company and its staff a little pat on the back before bedtime. A strict father, he had a sincere and honest relationship with his employees, to the point that for his 90th birthday, 1,700 people dined together in the factory. Enzo Ferrari has been physically missing from Ferrari for 30 years, since 14 August 1988, but has never really left, because the people who worked with him transmitted to their colleagues the passion and respect for the work that he saw almost as a vocation. As with the F40 of 1987, the last car personally approved by Enzo, all current Ferraris also capture and show the passion hardwired into their DNA. Ferrari always stands out on the market as well as on the track, because every car that carries the Prancing Horse on its body is still animated by Enzo Ferrari's dream, a dream that has become reality. "There are few today with the character, determination, and drive of Enzo Ferrari, Ken Tyrrell, Jack Brabham, Dan Gurney, and others of their ilk. Legends and Giants." "And the first Grand Prix, less than a moth after his death in a season dominated by the McLarens of Prost and Senna, His cars finished 1-2 at home. You couldn't make it up."